President Donald Trump, seen with Canada's Prime Minister Justin Trudeau during the G7 Summit in Quebec on June 8. There is the risk Trump might unilaterally withdraw from NAFTA. 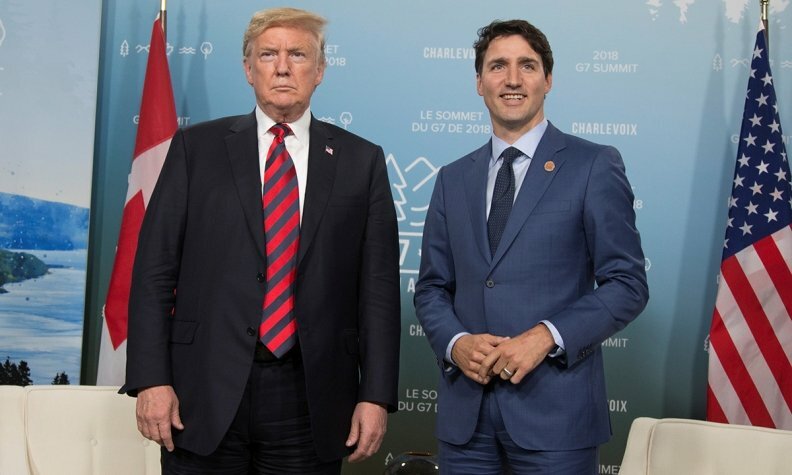 OTTAWA — Despite fresh rumblings of a bilateral deal between the United States and Mexico, Prime Minister Justin Trudeau is convinced that a full North American Free Trade Agreement is best for all three countries. Trudeau said Friday that NAFTA remains the preferred option for ensuring prosperity for workers across North America. "That's why we're committed to renegotiating and improving and updating NAFTA," Trudeau told reporters in Markham, Ont. Without elaborating Friday, Trudeau said: "We continue the discussions with the United States and Mexico." There is no immediate plan for Foreign Affairs Minister Chrystia Freeland to travel to Washington next week for NAFTA talks, said officials speaking on the condition of anonymity due to the sensitivity of the situation. Freeland, Finance Minister Bill Morneau and new International Trade Minister Jim Carr will visit Mexico City on Wednesday to meet Mexican President-elect Andres Manuel Lopez Obrador and his team. Some of Trump's senior cabinet members have already paid a visit to Mexico's new leader, which left the president upbeat about future trade prospects with that country. "We have had very good sessions with Mexico and with the new president of Mexico who won overwhelmingly," Trump told a cabinet meeting on Wednesday. "And we're doing really well on our trade agreement. So we'll see what happens. We may do it separately with Mexico, and we'll negotiate with Canada at a later time." Purdue persuaded Trump not to tear up NAFTA last year, but he told the president during the meeting this week that separate deals with the two countries might be better for American farmers. "They're very anxiously awaiting the wins, and we hope that the deal with Mexico and then Canada can come along very quickly behind that," said Purdue. "They believe that you are an American-first president and they want to be with you. We just need to help their pocketbooks." While it might appear as if the stars are aligning for a Mexican-U.S. pact, a leading Canadian business group said it is too early to press the panic button over NAFTA's demise and its replacement with two separate deals. That's because the Mexicans and Americans remain as far apart as they have ever been on key issues such as the proposed five-year sunset clause that Trump wants, said Brian Kingston, vice-president of the Business Council of Canada. Kingston said U.S. trade czar Robert Lighthizer prefers bilateral meetings rather than having both of his North American counterparts together in the same room. Indeed, Freeland met Lighthizer alone in late May in Washington as part of a final Canadian push to get an agreement before talks were suspended because of the July 1 Mexican election. NAFTA has created the supply chains that now move people and goods seamlessly across three countries, and a pair of two-way deals would hamper that, said Kingston. "Nobody wants two separate trade deals. That's clear coming from U.S. industry, Canadian business and Mexican business," he said. "That said, you can't rule it out. That's definitely the U.S. preference." Trudeau said Friday that getting a renegotiated NAFTA "is at the centre of everything we do" to create jobs and expand the economy. Former prime minister Stephen Harper recently questioned Trudeau's sincerity about reaching a deal. In July 11 remarks to a Montreal meeting of the Australia-Canada Economic Leadership Forum, Harper said that fighting with Trump gives Trudeau's Liberals a political win in Canada. "This is great for them. And so right now that is the strategy they are on," Harper said in a speech to the closed-door luncheon, a recording of which was obtained by CTV News. Trudeau said Friday he's consulted all recent prime ministers, including Harper, on NAFTA, but he refused to address Harper's criticism, saying the deal is too important. "I won't be playing politics with it," Trudeau said. "This is an all-hands-on-deck approach."